After return trips to ensure our first meal wasn’t a fluke, there is no doubt Parachute is impressive. 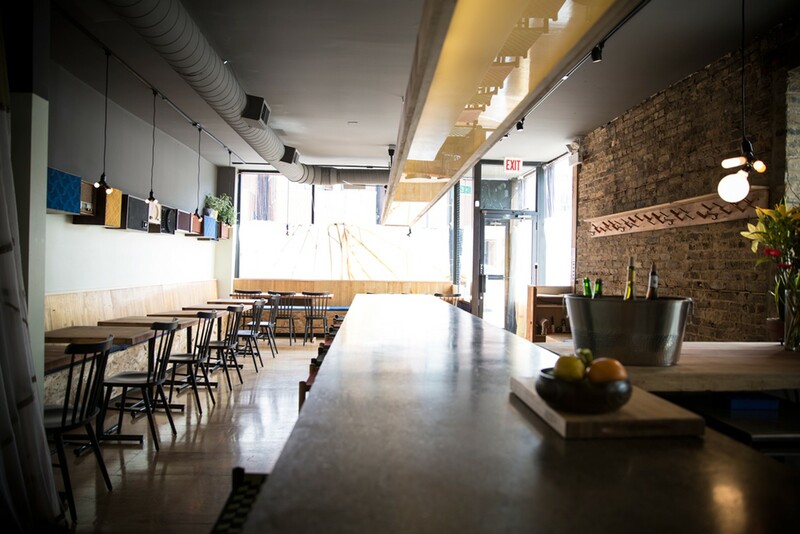 We aren’t the first to make this claim, evident by the fact you can tell half the crowd ended up here after googling “Best Restaurants in Chicago,” but we’d be bad friends for not emphatically letting you know that all the Parachute praise is legit. Parachute is impressive. Parachute is exceptional. Parachute makes us walk out of a meal thinking it was more enjoyable than most of the meals we’ve had at other restaurants, and we eat at a lot of restaurants. Parachute is nice, but not fancy. Different, but not crazy exotic. Lively, but not a party - you can easily hear the people sitting with you. The small restaurant seats 40 people at most, with a handful of tables that we prefer to sit at plus a communal counter. There are a few old speakers mounted to a wall up front to give it some identity, but otherwise design is minimal and sleek. The food speaks louder than the design, but it more than speaks to us, it sings to us, whether it’s the staple dishes or a few of the items that rotate in and out. The Korean American concoctions aren’t exactly Korean, nor are they American, but it’s the kind of fusion that make us nod our heads in approval. We don’t even like using the term fusion. Fusion gives the notion that you should expect to satisfy specific cravings for Korean and American food within a finite set of fusion rules, and that’s not the case. There are no rules at Parachute, only creativity that you should judge from a clean slate. Like a mid 90′s Mariah, Parachute’s food octave is in a league of its own. If you come to Parachute and don’t order the staple bing bread, then you should just give up on life altogether. It tastes exactly like a baked potato, but much better. Make sure to be generous with the sour cream butter, and know that a half order is good for two people, but any more than that and you need the whole. Think of this like a chopped asparagus side salad, and a little more sophisticated than the one your Aunt Cindy made at the last family barbecue. It’s mixed with tandoori chicken skin and an Indian style raita that gives the asparagus a noticeable kick of heat. I wasn’t sure what to expect from this fried tapioca, but even if I had expectations, they would have been blown away. These little fried tapioca blocks are a little crispy on the outside, spongy on the inside, and covered in truffle furikake (seasoning) because why not. Three different versions - kimchi, chili chayote, and watermelon radish zuke. All interesting, all good. The sesame leaves themselves have only subtle flavor, but the tempura fry bath they get is absolutely perfect. The bourbon barrel soy sauce adds some sweetness too. Boudin noir is blood sausage, and this is one of the most interesting dishes we’ve ever had. A smooth block of blood sausage sits in the middle of the plate, covered and surrounded by what Parachute calls a “seedy salad” with rhubarb and raspberry vinegar. Know that there’s popcorn in the seedy salad, and if blood sausage at all interests you, this is a must try. Tender pieces of sliced duck breast with wheat berries, fava beans, ramps, and feta. It’s great duck, but unless you’re ordering the whole menu, we’d lean towards ordering one of the two other dishes below. Bi Bim Bop on steroids with Spanish mackerel, escarole, barbecued onion, seaweed, and a soft egg. This isn’t the cheap version from your local spot, and it’s best if shared amongst a few. The first time we had Parachute’s hot pot was the exclamation point on confirming this place is the real deal. They take a seemingly straightforward dish and manage to make it so damn good. It’s the most expensive thing on the menu at around $38, but it’s large and more than enough for a couple of people. The version we’ve had includes a delicious broth with a bit of spice, wheat noodles, black radish, little neck clams, leeks, egg, and wild fern. You want this, or whatever similar style is offered when you’re there.